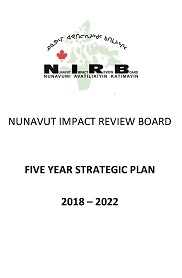 During the 2017-18 fiscal year the Nunavut Impact Review Board (NIRB) developed the third iteration of its five-year Strategic Plan, which become effective on April 1, 2018 and addresses the period of operations from 2018-2022. 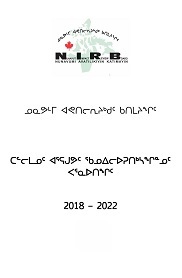 The NIRB’s Strategic Plan provides a comprehensive overview of the Board’s mandated functions and duties, establishing the objectives of the organization, including areas targeted for improvement or further development and the associated funding requirements for a five-year period. 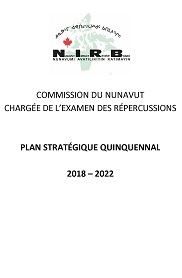 As an institution of public government created through the Nunavut Agreement, the NIRB is a unique organization with an important mandate to fulfill. 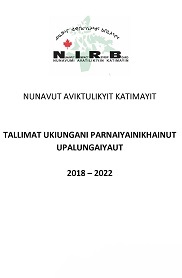 This Strategic Plan sets out the major goals of NIRB for the next five years and includes mechanisms for annual updates and regular reporting on progress through the public release of the NIRB’s annual reports and audited financial statements. The NIRB will comply with the requirements and spirit of the Nunavut Agreement and all applicable legislation. The NIRB will conduct high quality impact assessments. The NIRB will maintain long-term organizational stability. The NIRB will reflect the principles of Inuit Qaujimajatuqangit/ Qaujimaningit through its work. The NIRB will promote public confidence and participation in Nunavut’s regulatory system and the NIRB’s processes. The NIRB will collaborate to manage marine issues.